The perfect meal for after school, the meatballs can be served with baked potatoes if preferred. Make a batch & freeze some for another day, there’ll be no complaints! Pre-heat the oven to: 180˚C/350˚F/Gas Mark 4. Place the meat in a large glass bowl with the onions and garlic and add the breadcrumbs, tomato puree and dried herbs. Add in the egg to bind the ingredients together. Mix the ingredients well using either a wooden spoon or your hands. Using wet hands shape the meat into meatballs. Cook the meatballs in a large deep sauté pan for 3 to 4 minutes and then transfer to the pre-heated oven for 15 to 20 minutes to ensure that they are thoroughly cooked. Fry the onion, mushroom and garlic until nice and soft (approximately 3 to 5 minutes). Add in the mixed herbs, chopped tomatoes and brown sugar. Allow the mixture to bubble away for about 10 minutes. If using the cream add to the sauce now to enrich it. Adjust the seasoning and add the meatballs to the sauce. Cook the pasta in a large pan of lightly salted boiling water as per pack instructions. Drain the pasta and season with some salt and pepper. You can at this stage add a knob of butter to the pasta if you wish. 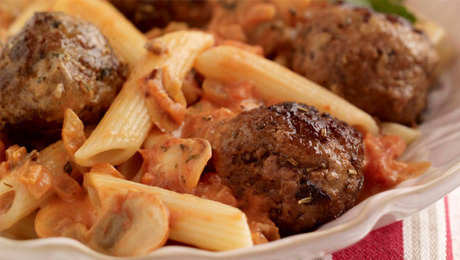 Serve the pasta and spoon over the meatballs & pasta sauce. If you'd like to freeze the meat balls we would suggest to freeze them after they are cooked. At what stage can you freeze the meatballs? Before they are cooked, or after? Beef stock goes in after the mushrooms and before the tomatoes while making the sauce. Did i miss it or can someone tell me at what stage/where do you add the 100ml beef stock?? Another really tasty, easy to follow recipe.